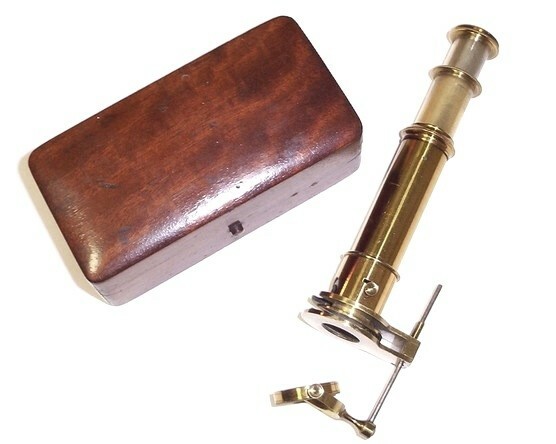 This is an example of the Swift-Brown pocket microscope from around 1880. It was sold with and without a stand and with varying accessories. The example shown here is without the stand. 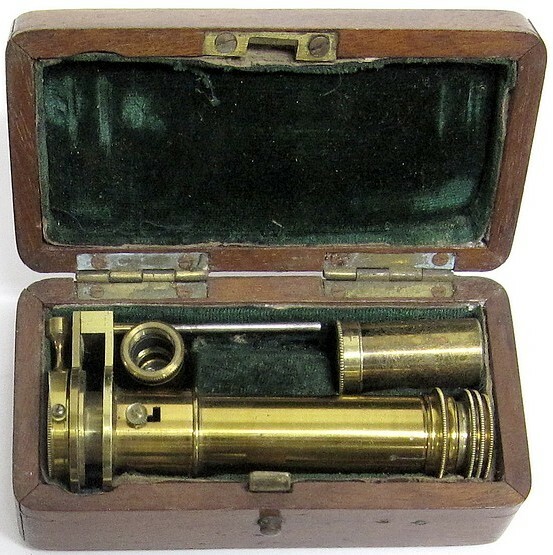 The small pocket microscope, represented in figures 158 and 159, should also be mentioned. 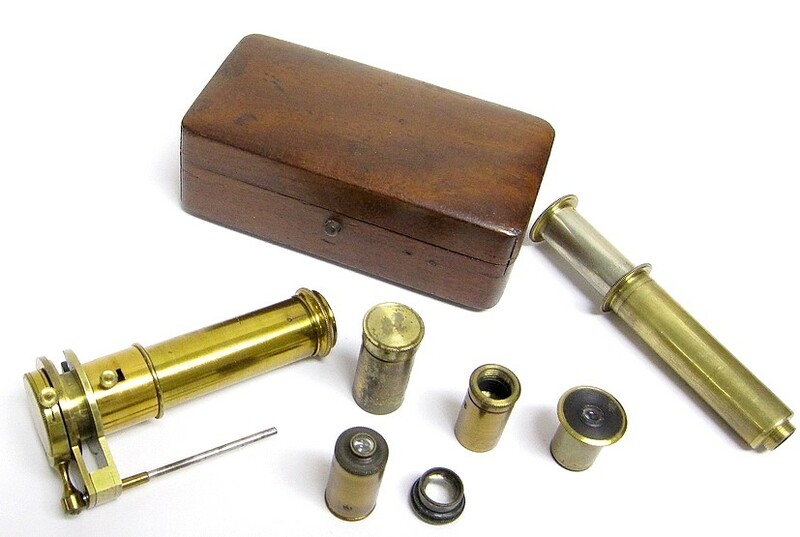 It can be conveniently carried in the breast pocket, for when the apparatus is closed it is only 7 centimetres (3 inch) in length and 2 centimetres (3/4 inch) in diameter. 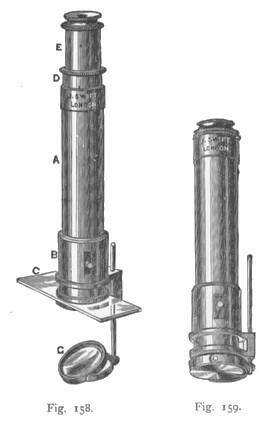 One of these figures represents the microscope closed, and the other the instrument ready for use. The preparation C is held firm by a small tube B, containing a spiral spring. The rapid movement is made with the tube D, and the slow movement by the tube E, which contains the ocular. 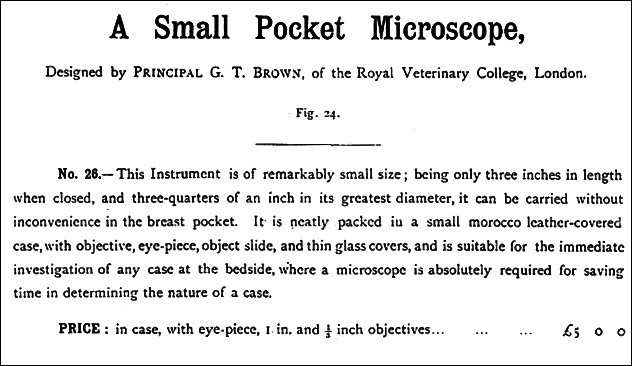 The microscope furnished with an ocular and objectives of 1 inch and 1/5th inch, costs 5 pounds. Not having seen any recent objectives of this maker, we cannot give an estimate of their value. Those which we examined in 1878 were good (see Third Edition, p. 172).